A gala event is a great way to raise funds for your favourite charity or cause and gives guests a fantastic excuse to dress to the nines and let their hair down for the night. If it’s your first time hosting a fundraiser gala event, you might be feeling a little nervous – but there’s no need to be! Simply follow these tips to prepare for the event of the season. Treat your fundraiser gala like the red carpet event it is – perhaps by laying out an aforementioned carpet at the entranceway! Guests will love feeling like stars, and if you or others on your gala committee are on hand to greet them at the door that’s even better. Warmly welcome them to your event and thank them for coming, before showing them to their seats or to the bar. If your gala has a theme, make sure this starts right from the entrance way. Event lighting hire can make or break your gala event. Professional lighting is a good idea to help get guests in the party spirit and transform venues from bland to grand. Moving lights can help to create moods, with spotlights highlighting speakers and key elements of the evening. Alternatively, wash the space with a dazzling shade of cobalt or fuchsia to help tie together your theme. If you’ve got live entertainment and performances, consider a timed light show to keep guests engaged throughout the duration of the act. Subtle uplighting can be used to showcase key features of your gala, such as artwork or other displays. One easy way to raise money at a gala is by having an auction during the event. Many guests love being able to bid on a unique experience they would not otherwise get the chance to have, such as a dinner with a local celebrity or backstage passes to a show. If you decide to sell memorabilia, make sure it’s of excellent quality and is something your guests will want. Sporting and popular culture items are always a hit. 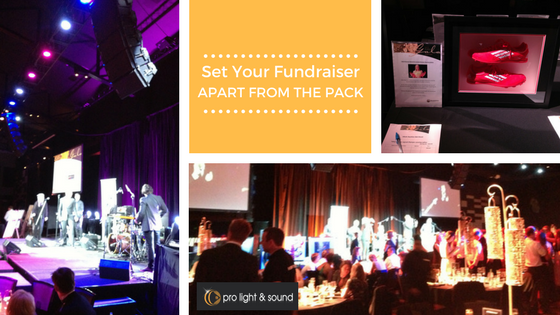 With more than 20 years of experience in audiovisual equipment, Pro Light & Sound have the knowledge and the resources to help ensure your fundraiser gala goes off without a hitch. Talk to the team at Pro Light & Sound today to find out how much of a difference a quality theming and lighting can make to your event.